Nationally, enrollment in for-profit colleges is on the rise. Though the vast majority of students enrolled in two-year post-secondary institutions still attend public community colleges, enrollment in private, for-profit colleges has increased by 63 percent since 2001. (1) In Washington, increasing numbers of students are earning certificates of less than two years. 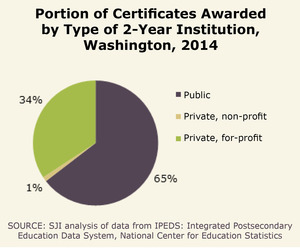 In 2014, for-profit colleges awarded more than one-third of these certificates. (2) However, questions remain about the labor market value of these credentials. On average, two-year for-profit colleges cost students four times as much as community colleges. (3) High costs lead students at for-profit colleges to borrow more often. According to the U.S. Department of Education, more than 80 percent of students at for-profit colleges use federal student loans to pay for college, compared to fewer than half of students at public colleges. (4) Increased borrowing could be worthwhile if graduates of for-profit schools were more likely to secure employment and attained positions with higher wages than their community college counterparts. However, given the cost of attendance, returns need to be quite high to justify attending for-profit colleges. In fact, researchers estimate that returns of about 9 to 10 percent per year of education are needed to offset the costs of attendance for students and taxpayers. (5) Few experimental studies have examined whether completing a for-profit credential could produce such labor market returns. However, field experiments suggest that employers do not place a higher value on for-profit credentials. And, in some cases, having a for-profit credential on a resume may make it more difficult for people to get a foot in the door. For health jobs, primarily medical assistants, resumes with certificates from for-profit colleges were 57 percent less likely to receive a callback from an employer than those with similar credentials from public institutions. Based on employer callbacks, the researchers found no indication that resumes with for-profit credential generate more employer interest and noted that the opposite may be true—that community college credentials may be more attractive to employers. They conclude that for-profit college attendance offers limited labor market benefits to students. Another field experiment recently released found that for health jobs, primarily medical assistants, resumes with certificates from for-profit colleges were 57 percent less likely to receive a callback than those with similar credentials from public institutions. (7) However, there was no difference in callback rates for jobs that required a license, such as licensed practical nurse and pharmacy technician. This suggests that employers were skeptical of the quality of for-profit colleges, unless graduates’ skills were validated by a third-party licensing entity. Given that for-profit colleges are serving increasing numbers of students and award a considerable share of certificates and degrees lower than bachelor’s degrees, students need to be made aware that they may not be getting their money’s worth. 1. Analysis of U.S. Department of Education, National Center for Education Statistics, Integrated Postsecondary Education Data System (IPEDS), 12-month Enrollment data. 3. U.S. Department of Education (2015). Fact Sheet: Obama Administration Increases Accountability for Low-Performing For-Profit Institutions. Available at: www.ed.gov/news/press-releases/fact-sheet-obama-administration-increases-accountability-low-performing-profit-institutions. 5.Cellini, Stephanie Riegg. (2012). For-Profit Higher Education: An Assessment of Costs and Benefits. National Tax Journal 65: 153–79. 6. Darolia, Rajeev, Cory Koedel, Paco Martorell, Katie Wilson, and Francisco Perez-Arce. (2014). Do Employers Prefer Workers Who Attend For-Profit Colleges? Evidence from a Field Experiment. University of Missouri Department of Economics Working Paper 14-11. 7. Deming, D.; Yuchtman, N.; Abulafi, A.; Goldin, C. and Katz, F. (2016). The Value of Postsecondary Credentials in the Labor Market: An Experimental Study. American Economic Review, 106, 778-806. Did you know Seattle Jobs Initiative is on Facebook? Click here to "Like Us"! Seattle Jobs Initiative creates opportunities for students, workers and business to succeed by helping education and job training programs meet the demands of a new economy. We find and apply solutions for people to gain the skills they need for good jobs that create prosperity for all in today's marketplace.